The frequent rain these past few weeks has taken a toll on the ELAC campus, especially the E3 building area. The storm brought problems to ELAC’s underground water tank. The repairs should take about three months to finish. North of E3, in the quad area, students coming from parking structure three will notice fencing around the front area of the building. Abel Rodriguez, director of College Facilities, said one of his employees noticed that the concrete “buckled” in December. The floor sunk a bit, so immediately he thought it was the storm water tank. That turned out to be correct. The underground water tank compressed. Rodriguez said this problem won’t harm the building itself. He also said the foundation of the building is still sturdy, and the solution is replacing the water tank. The repairs won’t start immediately due to the weather. It will begin in the next few months. 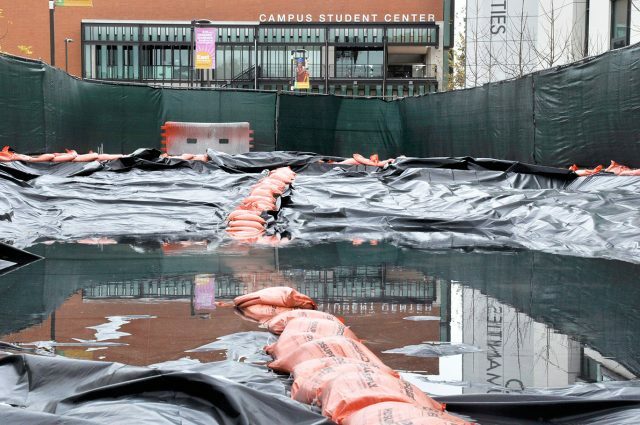 Construction workers didn’t want to have a “rain out,” which would have them work in mud and would be more difficult than the project needs to be. Some students have actually collided with other students. Nothing serious has occurred, but it’s still an inconvenience. “You can’t see if there is another person in front of you due to the angle we are walking because of this fencing,” said Isaiah Molina, an ELAC student. Rebecca Martinez, a student at ELAC, has a class in the E3 building and collided with another student in the walk space. “It’s just too small,” Martinez said. Molina said it doesn’t really affect him getting to his classes on time, but he understands how it can be frustrating to the teachers and students that are coming from parking structure 3.